In an attempt to commit suicide, a 20-year-old man stripped nak*d and broke into a lion cage inside Metropolitan Zoo in Santiago, Chile. 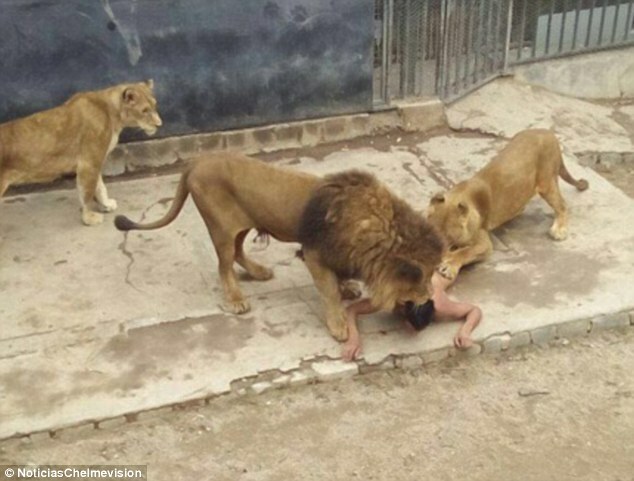 Although the man identified by local media as Franco Luis Ferrada Roman survived the horrific incident, two African lions had to be put down to prevent them from mauling him. Apparently, the man broke into the enclosure, removed all his clothes and jumped into the cage in front of other visitors including children. Inside the cage, the lions didn’t immediately attack Roman as they were seen “playing with him.” However, zookeepers had no choice but to shoot the lions in order to save Roman as he was already being attacked by the pair. “It was from there that he jumped, took off his clothes and started to attract the lions,” she added. Deeply affected by the untimely deaths of the male and female lions, Montalba explained that there were no fast-acting tranquilizers to stop the lions from attacking Roman. “The zoo has an established protocol because people's lives are very important to us,” Montalba said. Meanwhile, witness Cynthia Vasquez claimed that the zoo security personnel had a slow response. She also insisted that the lions did not immediately attack Roman. A couple of other witnesses also said that they heard Roman screaming “religious things” inside the cage. A suicide note, which was later found in Roman’s clothes, revealed that the man several references to the apocalypse as the reason behind his suicide attempt. Roman suffered several injuries as well as head and pelvic area trauma but is no longer in a life-threatening condition.